The USB-2045 is a full-speed USB device with 16 digital output channels module, and offers features for industrial control and manufacturing test applications, such as factory automation or embedded machine control. The USB-2045 supports source type output and equips with short circuit protection. 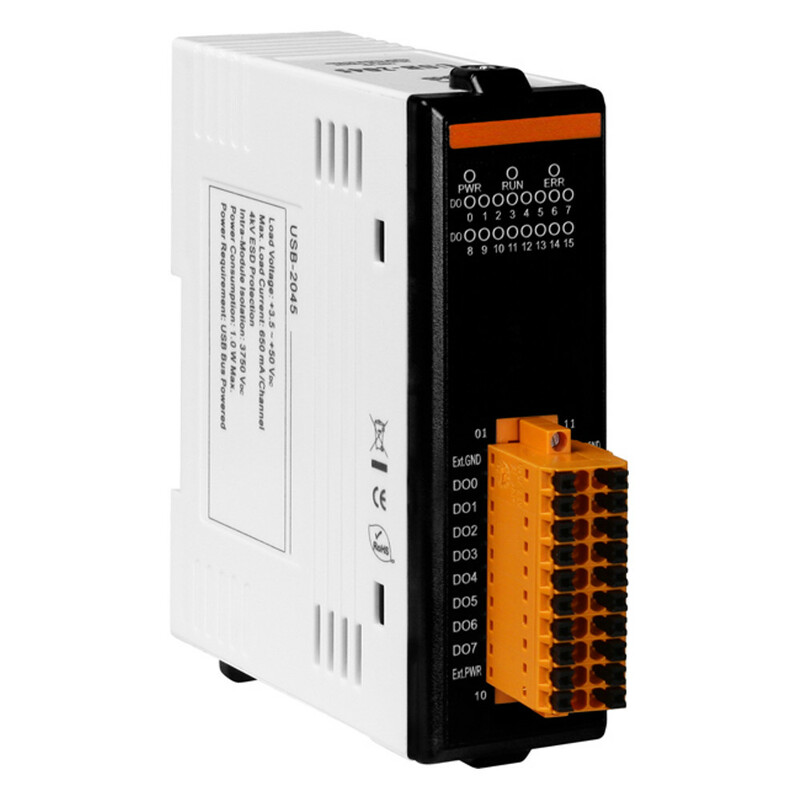 There are options to enable both power-on and safety value, and 16 LED indicators that can be used to monitor the status of the digital output channels. The 4 kV ESD protection, 4 kV EFT protection, 3 kV surge protection for power input and 3750 VDC Intra-module isolation are standard. With the true Plug & Play capability, it needs not opening up your computer chassis to install boards-just plug in the module, then get or set the data. Owing to another USB feature known as "hot-swapping", users do not even need to shut down and restart the system to attach or remove the USB-2045. The USB I/O utility can help users to configure and test USB-2045 quickly and easily without programming; In addition, we also provide the friendly API library and demos for users to develop own USB application with various application development tools (VB/C++/C#.NET/VB.NET). Therefore, the USB-2045 is the perfect way to add control capability to any USB capable computer.